2018 has arguably been one of the most innovative years in the smartphone industry. The year started with the adoption for the display notch, which was then replaced by motorised components and relatively smaller cutouts. We also saw devices with multiple camera sensors — at times with even four lenses on the back — hit the shelves. Then there were features like faster charging standards, a higher amount of RAM and more, but are all of these features the need of the hour? To pick the brain of our readers, we tweeted a series of polls (each of the polls was active for 72 hours) to gain an insight as to whether they feel these advancements are for the better or purely gimmicks. With more than 25,000 respondents, read on ahead to find out what the majority of consumers expect from smartphones in 2019. Is more the merrier when it comes to RAM? The smartphone industry scaled the 10-gigs peak when it came to RAM, but the mid-range segment is still restricted to 4GB of RAM. We asked our readers whether they prefer 4GB or 6GB RAM in smartphones that cost less than Rs 30,000. Needless to say that the majority of consensus was in favour of 6GB. We agree to this because while 4-gigs RAM might be able to handle normal day-to-day tasks, it is likely to buckle under heavy load while playing a game like PUBG. On the other hand, 6GB is just the right amount of memory needed for a smartphone to perform optimally, no matter what you throw at it. What started as the means to get great portrait shots with assistance from a secondary depth-sensing camera soon became a race to cramp in more cameras on the smartphone. Hence, it comes as no surprise that 59 percent of users expect smartphones launching in 2019 to offer triple snappers on their back. Does megapixel count in a smartphone really matter? It has been a long-debated concern that whether the megapixel counts of a smartphone camera really matters. 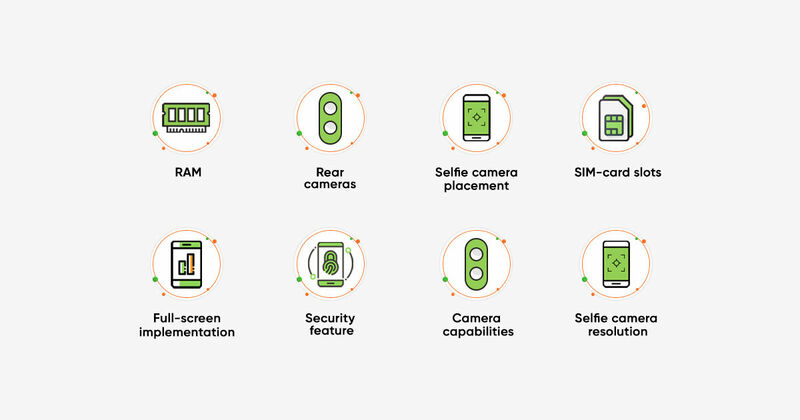 So to gauge the perception of the common users, we asked our followers to vote among 32MP, 24MP, 12MP and 8MP resolutions for the front camera. And the poll results ranked the resolutions in that very order, thus proving that when it comes to the smartphone snappers, megapixel counts are still the gauge for the camera quality. What is the most important feature of rear camera(s) on a smartphone? Speaking of rear cameras, an increase in the number of sensors has opened up possibilities of features that were unheard of just a couple of years back. Some examples of such features are the Bokeh mode, wide-angle, low-light, and 3D imaging. We asked our readers of the former three, which would they like to see on future smartphones. Nearly half of the voting consensus was in the favour of all three capabilities, with low-light, wide-angle and bokeh being ranked in that, order. Well, who wouldn’t love to have them all? Hide the selfie camera or put it in a notch? From display piercings to elevating mechanisms, we have seen brands do everything to obscure the selfie camera in a bid to increase the screen-to-body ratio. As we witness the display notches shift from the IT thing to the thing of past, we questioned our followers whether they would prefer a notch camera or a concealed selfie snapper that presented itself only when needed. While it was a close contest, the fact that the elevating camera facilitates an extremely sleek and uniform fascia, tipped the audience in its favour with 51 percent votes. In between, when smartphones were getting thinner and sleeker, brands introduced the dreaded Hybrid SIM slot. This particular SIM tray came with two slots, where one was reserved for your main SIM and the other could be used to insert either a secondary SIM or a microSD card. Needless to say, it received a fair share of backlash from users who had two numbers and also wanted to expand storage. This is why 61 percent users voted in favour of triple slots with one reserved for expandable storage. Once upon a time, the cutout on the top of the display screamed premium and was a novelty. However, from being the mark of a high standard to an eyesore, the transition has been swift and how. Nowadays, the true-blue fullscreen displays are all the rage and why not since they offer an amazing immersive viewing experience. A total of 74 percent of voters feel that a notch-less display is the way to go. Let your face or finger do the unlocking? The whole notch and fullscreen fad in the smartphone industry have led to more innovative methods of unlocking and securing the phone. We have seen brands completely ditching conventional biometrics to rely solely on the face unlock and also the onslaught of in-display as well as a side-mounted fingerprint scanner. In our Twitter poll, we saw 42 percent votes in the favour of under-display biometrics and 31 percent voting for the conventional PIN / pattern unlock. The face unlock method was the least preferred with 27 percent, since it’s not as secure as the first two. It’s clear that these polls smartphone brands a blueprint as to what users are looking for from the prospective phones this year? Now, all we’ve to see is who’d rise to the occasion? Did you vote for any of these options in our polls? If not, you can still tell us what you think in the comment box below.